Preface Mathematics is the science that developed from the investigation of figures and computing with numbers. For mathematics, there is no commonly accepted definition; today it is usually described as a science that investigates abstract structures that it created itself for their properties and patterns. Mathematicians seek out patterns, formulate new conjectures, and establish truth by rigorous deduction from appropriately chosen axioms and definitions. 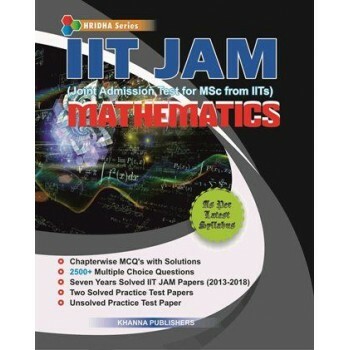 This book is meant for the students who are appearing for IIT JAM and IISc. It is also useful for those who are aspiring and preparing for competitive examinations such as CSIR-UGC-NET/SET, UPSC or other State service examinations. The main purpose of this book is to help students to know about the pattern of questions asked in the various competitive examinations and also provide them topics for their preparation. Each topic has been covered comprehensively with number of multiple choice questions along with their explanations wherever needed. Every attempt has been made to make this book student friendly, but some errors might have crept in. Suggestions for improvement of the text, and intimation of misprints will be thankfully acknowledged.